I would like to thank the organizers of the International League of People’s Struggles conference, “Right to Exist, Right to Resist,” for bringing us here today to connect struggles around the world, in particular those in the forefront of the struggle against imperialism, hegemony, dictatorship, plunder, military and economic intervention, and for liberation and sovereignty. 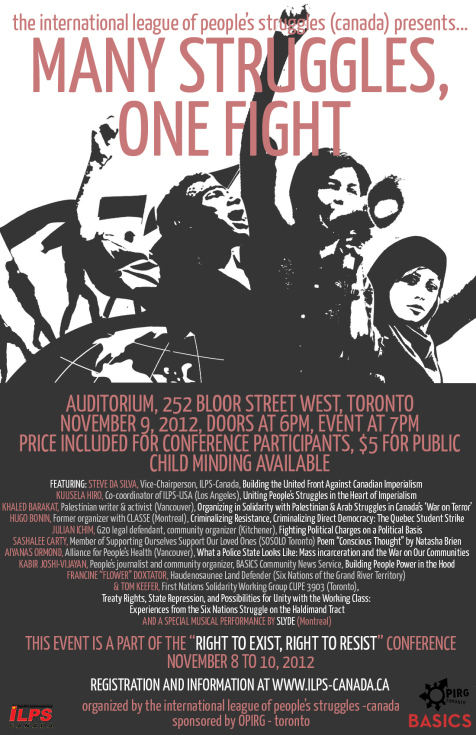 In Canada, the oppressed communities are engaged in an extension of the struggle in our homelands for liberation; at the heart of our struggles here is the Native and Indigenous struggle, which has been taking place for hundreds of years, confronting the colonial settler state of Canada. I want to begin by saluting the martyrs, wounded and prisoners of the Indigenous native struggle on this land, who have sacrificed so much to defend their land against settler colonialism. If you understand the Palestinian struggle, then you understand the indigenous struggle here – we resist the same enemy and system of oppression. When we speak about Palestine, we are discussing a nation that was placed under a brutal system of colonization, particularly since the beginning of the last century when Palestine fell under the colonial control of Britain (the same colonial power that colonized this land). On November 2, only a few days ago, we marked the 95th year of the infamous Balfour Declaration, when Sir Arthur Balfour, British Foreign Secretary, promised the Zionist movement leadership to establish a “national home for the Jewish people” in the land of Palestine – land that was not his to give or concede – at the expense of the indigenous Palestinian people. Palestine is a land that has been inhabited for thousands of years by its own native people, with our own culture, history, language, values and symbols, without any interruption, on our homeland. Most Palestinians, particularly at that time were farmers, connected to their land as the only source of livelihood, resources and sustenance. Palestinians always resisted colonial control. Throughout the years of colonization from 1917 up until 1948, British imperialism through the British army and then the Zionist army suppressed Palestinians in three major revolts: the revolt of 1919; the revolt of 1936-39; and revolution and resistance in 1947-1948. And the criminalization of the Palestinian resistance dated from the first Palestinian protest against British rule and has continued since that day. Resistance is the natural human response to occupation and racism; Palestinians face two choices – to resist and struggle by all means, or to surrender and accept the slavery of apartheid, racism, and subjugation. In the early part of the 20th century, imperialist powers wanted to establish a state in the heart of the Arab world, supporting this state with all means – weapons, financial support, military support, and most importantly, by directing Jews around the world to go to Palestine and become settlers, in order to “solve” through colonization what was then labelled the “Jewish question” in Europe while simultaneously further dividing, in order to control, Arab peoples. In order to do that, the Zionist movement displaced and uprooted the vast majority of Palestinians in the Nakba of 1947-1948, who found themselves living in refugee camps and in tents provided by the United Nations on a promise that this will not continue for more than a few days or weeks, and that they would be able to return soon to their homes, once the fighting stopped – but this did not happen and still has not yet happened today, 65 years later. Now there are over 6 million Palestinian refugees in the world, who suffer daily hardships, economic and social deprivation, and siege, were subject to massacres, and are still prevented from returning to their homes. Those Palestinians who remained in Palestine were placed under a brutal military occupation, a unique form of military apartheid that has never before been witnessed in human history – an occupation that extended and grew nineteen years later to encompass all of Palestine’s soil. This is a bit of history and an introduction to the struggle in Palestine, which has become a global symbol of resistance to imperialism, occupation, and colonialism. Palestinians today would find themselves almost alone – if it were not for Arab popular solidarity and international solidarity and international struggle, as expressed in the work that all of you do here. The camp that Palestinians fought – the powerful imperialist camp, including the British, the Zionist movement, the US, and their collaborator regimes – is the same camp today. It is also true that the camp of allies and friends of our people is the same today – the camp of people’s movements and liberation movements for sovereignty, self-determination, freedom and liberation everywhere in the world. We mourn and demand justice together for the same atrocities, and we celebrate together our victories: people around the world celebrated the results of the recent elections in Venezuela, seeing that the Bolivarian revolution would continue; and celebrated the January 25 uprising of the Egyptian people when the longtime dictator, and servant of the US, Hosni Mubarak fell before the united people. And despite all of the efforts by the Zionists to redefine the meaning of our struggle, it is still today, just as it was yesterday, and just as it was 65 years ago, a struggle for refugees to return to their homes and for a nation to practice their self-determination on their national soil. Our struggle is not about establishing a state in part of Palestine, nor is it a struggle to establish a political entity or Authority, but it is a struggle whose final aim is to defeat the racist rotten colonialist system in our homeland, to liberate our land and people and to establish a democratic Palestine on the entire land of Palestine where all live in equality and enjoy freedom and justice. We must also examine Canada’s role. Canada is, almost, a greater state of Israel. It is similar in its settler colonial nature, in its past, and in the subjugation of its indigenous people. 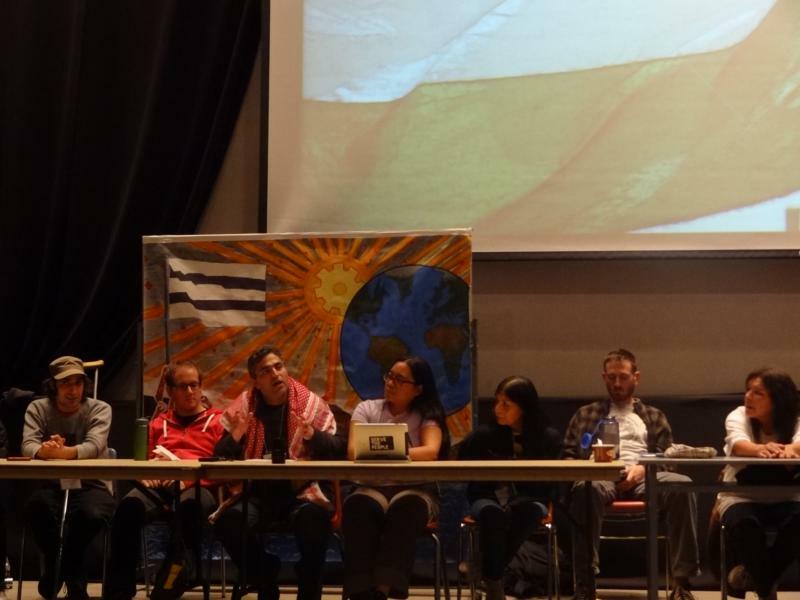 Today, as a Palestinian, when I look at the struggle of the indigenous native people in Canada and how it is being consciously suppressed by the state, and how indigenous people here are deprived of their rights to the land and instead are living in ghettoes and reserves, it only strengthens my conviction that despite the power and the means of imperialism for hundreds of years in the Canadian state, the struggle of indigenous people must be taken very seriously by all movements and organizations who struggle on this land. Yesterday at this conference, there was discussion about armed struggle for liberation in many places around the world. The armed struggle that indigenous people engaged in, when indigenous people took up arms, was suppressed, and many were killed, because of the balance of power and the lack of broader support that they received – but resistance continues. Any political analysis that rules out armed struggle as a possible future for any indigenous nation struggling against settler colonialism is only a short term analysis at best. We believe that it is the right of a people and a nation to determine how they will struggle and choose the methods and means of that struggle. It is also our duty to support national liberation movements around the world and to elevate the relationship between the various revolutionary trends from rhetoric and political statements to actually joining forces – financially, militarily, socially, and politically. From 1965 through 1990, Palestinian refugee camps were always a welcoming space for national liberation movements and Palestinian movements provided support and training to the strugglers and fighters of our brothers in South Africa (including military and financial support) and today we see how the movement to develop Boycott, Divestment and Sanctions (BDS) and isolate Israel as an apartheid, racist, settler colonial, illegitimate state on the land of Palestine has been led to a large extent by South African activists, regardless of all reservations about the current situation in South Africa, showing once more that history does not disappear. What we do today, we will see the impact tomorrow. What you plan today, you will harvest in the future. The British called the Palestinian struggle in the 1920s and 1930s “terror,” they called our writings and studies “incitement,” they called our freedom fighters “savages” and they called our military operations “barbaric acts.” It should be noted that all settler colonial states, including Canada, the US, Australia and New Zealand, all of which arose under British auspices, engaged in the same process of criminalization and labelling of indigenous resistance – as did South African apartheid settler colonialism. This is still the language of imperialism and colonialism today – it has not changed. For Stephen Harper, Jason Kenney and John Baird, Sir Arthur Balfour’s faithful grandsons, Palestinians are still committing barbaric acts when we resist and we remain savages when we struggle for equality. These are the same words used to describe the struggle of indigenous people here and of revolutionaries around the world – in Colombia, the Philippines, Nepal, Afghanistan, Lebanon, Vietnam, and elsewhere. To throw a one ton bomb on a refugee camp in Gaza, or in Pakistan, or in Afghanistan, is not barbaric, when it destroys a neighbourhood of children and civilians. When NATO armies massacre civilians in Afghanistan, women and men in their homes, this is “collateral damage,” not “terrorism.” When Canadian mining companies exploit the resources and devastate the land of people in the Philippines, this is called “economic cooperation,” not “plunder.” On the other hand, to capture an Israeli soldier engaged in the military occupation of Palestinian land and seek to exchange him to liberate Palestinian political prisoners is labelled “terrorism” and that soldier’s name is known everywhere, while the hundreds and thousands of victims of their atrocities remain nameless. They give their acts names that are the opposite of reality, and they give us names that are the opposite of the true nature of our struggle. It is from this political discourse that the “War on Terror” emerged, in order to justify all of the atrocities committed against people. This is the same thing that we saw in Latin America in the so-called “War on Drugs” – a phrase that obscures the very real and very violent war on peasants and popular movements in Colombia and elsewhere in Latin America. But what we’ve seen from the results of these so-called wars – the “War on Terror,” “War on Drugs,” War on Extremism” – is that they create a climate of fear, and this fear and terror is a form of collective punishment to the people of the world. It drives oppressed communities into silence and isolation and political activists find themselves battling alone in courts, in prisons, and in the battlefield. Therefore, one of the most important goals and objectives of our struggle is to break fear and break silence. Because when that happens, unjust power and authority are going to face the people and not only the minority of political activists; instead, they will face the majority, mobilized and active. I do not know of a political system that faced the people – an entire nation – and did not collapse. 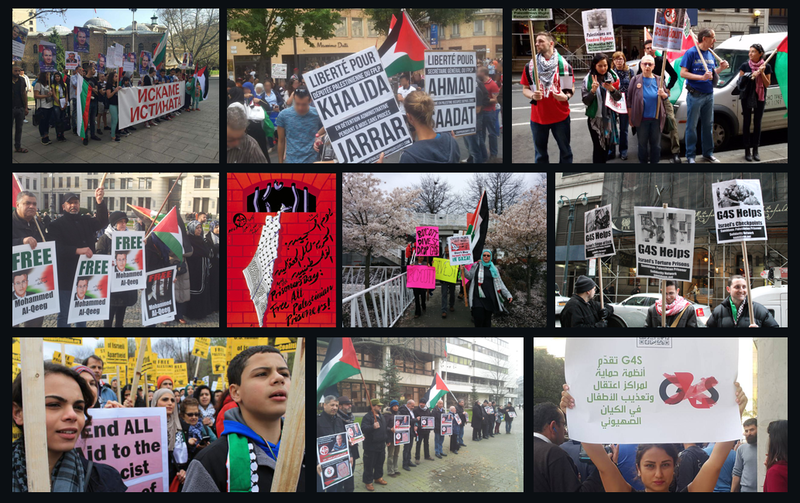 Palestinian communities in North America are beginning to break the chains of fear and silence. They have been organizing popular conferences to mobilize, organize and activate community institutions in Chicago led by the US Palestinian Community Network, conferences to support refugees’ right to return in California, led by Al-Awda, the Right to Return Coalition and this May, Palestinians from North America and the diaspora will be convening a conference of the Shatat – Palestinians in exile and diaspora – in Vancouver, Canada. My final comments: I want to reaffirm what Leila Khaled said yesterday in her speech, that we call upon our comrades in ILPS to adopt a campaign for the freedom of almost 5000 Palestinian political prisoners held in Israeli prisons, including Palestinian national leader Ahmad Sa’adat, the General Secretary of the Popular Front for the Liberation of Palestine. Our political prisoners are the heart of the Palestinian national movement. They are the leaders of women’s organizations, labour unions, student movements, political parties, and the military branches of the resistance. I also call upon you to be part of a campaign to lift the shameful designations of Palestinian political parties and movements as so-called “terrorist organizations” by the Canadian government (and the US and the EU) as part of their campaign of fear and suppression. We must defend the right to resist and break the wall of silence these lists attempt to impose against us. I would like to end by saying that our struggle is connected not because we say these words, but because it is our reality. And just like our enemy camp is connected, and has common interests, works together, and supports each other for its own economic and political gains and for maintaining their hegemony, our struggle is connected for an alternative world, an alternative society, and alternative laws that guide human relationships, a society built on justice, peace, and equality. Long live Palestine! Long live international solidarity! Khaled Barakat is a Palestinian writer and community organizer. His writings have been widely published in a variety of Arabic-language media outlets, including Al-Quds al-Arabi, el-Badeel daily newspaper of Egypt, as-Safir of Lebanon, and Arabs48. He is active with Samidoun Palestinian Prisoner Solidarity Network and has co-founded various Palestinian and solidarity organizations in Canada and the US. 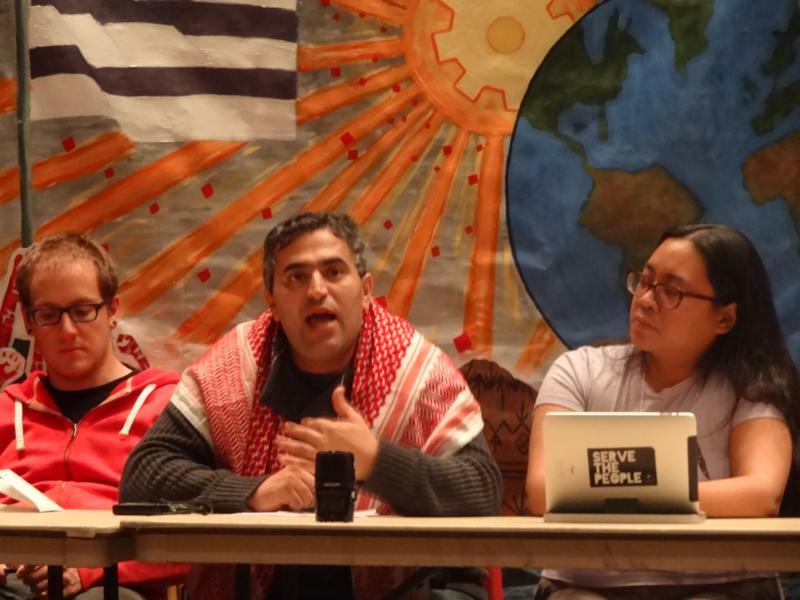 He recently coordinated “Resistance, Refugees, Rights and Return,” a delegation to Gaza of international solidarity activists; and is currently coordinating organizing efforts for Return: Conference of the Palestinian Shatat in North America in Vancouver, Canada in May 2013.